Fiorentini and al. 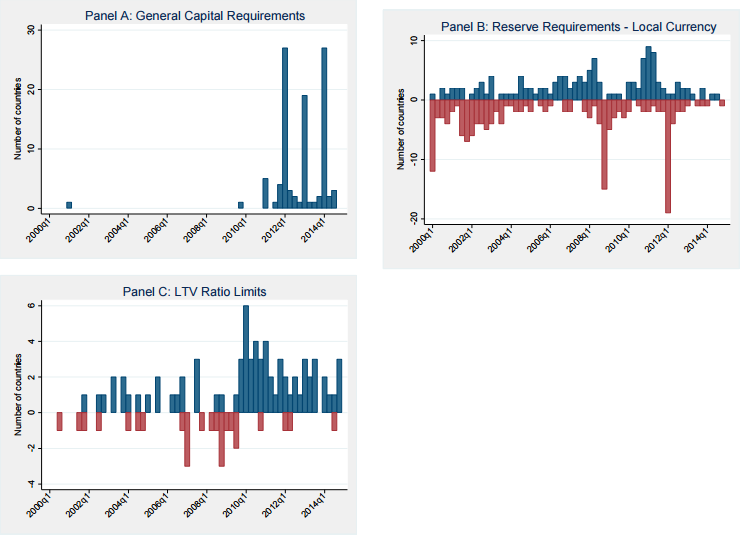 find that loan-to-value (LTV) caps and reserve requirements (on foreign and local currency) have the largest number of tightening and loosening episodes, despite not being the most implemented prudential instruments across countries. 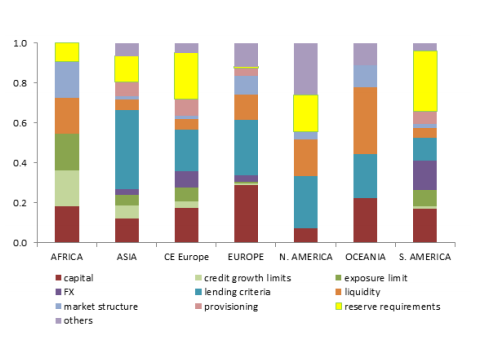 The index incorporates 8 elements crucial to the macroprudential framework: (1) the authority the central bank has in carrying out macroprudential policies; (2) the number of entities responsible for the maintenance of financial stability and their mandates; (3) the existence of a deposit insurance scheme; (4) the degree of transparency and accountability in the macroprudential regime; (5) the governance of the macroprudential framework; (6) how resorting to macroprudential instruments influences the monetary policy transmission mechanism; (7) how far the current macroprudential regime is from the FSB/G20 recommendations (timeliness and responsiveness to regulatory reforms); and (8) how quickly policy makers respond to the need to implement FSB/G20 measures intended to ensure financial system stability. “Organizational changes” refers to the impact of organizational changes in central banks since 2011.